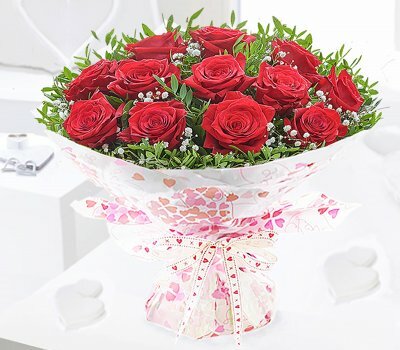 This hug's and kisses red rose hand-tied is a real symbol of devotion so imagine their surprise and excitement when this gorgeous red rose hand-tied bouquet arrives, these beautiful luxurious fresh twelve large-headed red roses are carefully hand-tied and arranged with fresh greens and complemented with a sprinkling of dainty white gypsophila to retain their individual beauty. 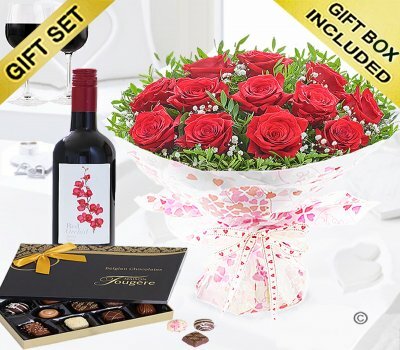 Plus as an extra touch, this valentine hug's and kisses hand-tied is delivered with a lovely delicious medium bodied merlot red orchid wine and a stylish black and gold box of assorted box of luxury Belgian chocolates a lovely finishing touch for your Valentine to enjoy. 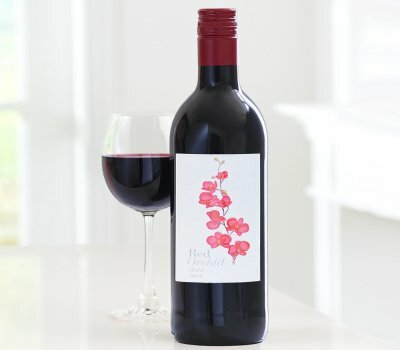 Red Orchid Wine: a bright youthful colour with succulent raspberries and red plums on the nose, the palate is soft and fragrant with violets and redcurrants, Round, balanced and easy drinking this has a sprinkle of tannins on the finish to add length and structure a soft and fragrant palate with violets and redcurrants and a nose of raspberries and red plums, perfect with friends or enjoyed with pizza, red meat pasta dishes or BBQs. Featuring: 6 x large-headed red roses hand-tied with danity gypsophila, pistache and salal, beautifully wrapped in frosted heart flowerwrap, trimmed with a Hug and kisses ribbon bow, hand-delivered in a stylish gift box, finished with flower food, card and envelope with your personal message in..1 x 750ml bottle of red orchid spanish merlot medium bodied red wine (750ml - Vol 13%) (Best severed at room temperature - Wine Glasses not included) 1 x 115g Box of luxury Belgian Chocolates. (Allergy Advice: this box contains 11 Luxury Chocolates, these chocolates do not contain any artificial colours or flavours. Contains: Milk, Lactose, Nuts, Soya. May contain traces of egg, gluten, other tree nuts, peanuts. This products is alcohol free.